For years, John Battelle, entrepreneur, technology innovator, and the founder of Wired, drilled into media and marketing professionals the idea of NOT building your content house on rented land. As recently as two years ago, he clearly stated that “if you’re going to build something, don’t build on land someone else already owns. You want your own land, your own domain, your own sovereignty.” Why? Simply put, once you publish on someone else’s platform, you do not own the subscribers or assets associated with that content. Even if you build followers or fans on that platform, it doesn’t give you the right to communicate with them. We’ve seen the effects of building on rented land. Brands of all sizes built their content houses on Facebook, amassing, in some cases, millions of followers. 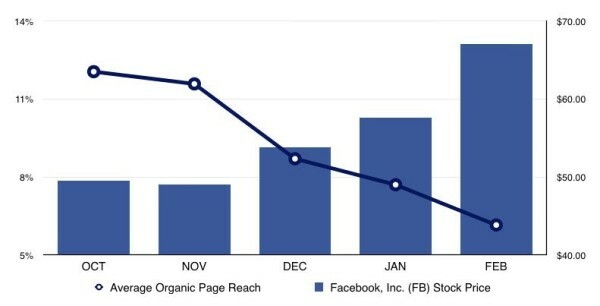 Where Facebook once allowed brands to reach their audiences directly, organic reach has now plummeted to all-time lows. In this chart from Jay Baer, Facebook organic reach continues to spiral downward while Facebook’s stock price continues to jump. Once Facebook “decided” to make money, it squeezed out direct communications to your fans in the hope that you would pay to reach them. Facebook executives were 100% correct on that notion. And it’s not just Facebook. The case can be made that we have been slowly moving back to the television era, when CBS, ABC, and NBC owned the majority of the access to the audience. Today’s networks are now Facebook, Snapchat, LinkedIn, Instagram (part of Facebook), and Twitter. Simply look at the changes the folks at LinkedIn and Twitter are making to their algorithms. They are deciding what your followers see, and in most cases, it’s not your “stuff.” Either you can sit back and watch as nothing happens, or try to reach your audience by paying a larger portion of rent (advertising). The rent was once free, and all was right with the world. The new networks want to make more money (and it’s their prerogative to do so). The question is, can you afford to make rent payments or is there a better way? Medium, another growing “network,” is making the case for becoming THE publishing platform on the web. Its beautiful interface and easy-to-use back-end tools have enabled companies to move their blogs permanently over to Medium like Basecamp did with its Signal vs. Noise blog. David Heinemeier Hansson, founder of Basecamp, said that the move from “owned” to Medium provided Basecamp with a solution to ongoing IT issues, as well as the ability to reach a new sphere of influence in the Medium community. Yeah … and I’ll be over 6 foot in height someday. Heck, I’ve been wrong before (just ask my wife and kids), but how do we know that Medium won’t change its rules? If Medium goes out of business, will the platform continue to be supported? Are we positive it won’t offer advertising on our platform? It is likely that YouTube and even Facebook didn’t know their future direction would include squashing organic requested (opted-in) content as they evolved their business models. Can Medium make significant revenues and stay true to these promises? Anakin Skywalker or Darth Vader? Now let’s go back to our friend John Battelle – our fearless leader of all that is good and earnest with publisher-owned assets … I know we can count on him as our guiding light. A few weeks back, Mr. Battelle used Medium to announce the launch of his new company, NewCo Shift. It’s positioned as a business media property covering the business model transformation in technology. NewCo’s new home? Medium. Ah yes, email. Mr. Battelle will be leveraging Medium’s tools and reach, not to build an asset on Medium, but to leverage this “could-be-temporary” platform to build the real, monetizable asset – email. As we look at CMI’s own subscriber hierarchy, email is the pièce de résistance. To be honest, I’m not sure if Mr. Battelle has lost his mind or if this move is truly brilliant. Based on his past moves, I’m betting on the latter. Like many individuals, my Aunt Patty (currently residing in Florida) wondered what I actually do for a living. As background, Patty was and is a whiz in the real-estate market. To save time with the answer, my wife astutely answered “Joe is in the real-estate business, but his ‘land’ is on the Internet.” Brilliant. The point? Renting is fine, depending on what your goal is. But it needs to be known that every successful publishing operation – at one time or another – owns and has access to its assets. As certain networks get larger and more influential, the dark side of the force will continue to reach out to you and pull you in that direction. I’m all for leveraging as many social media networks as makes sense for you to accomplish your marketing goals, but make sure you know what you are getting into. You should get up every morning knowing that the beautiful “rentals” you’ve created on these networks may have been swallowed up overnight. 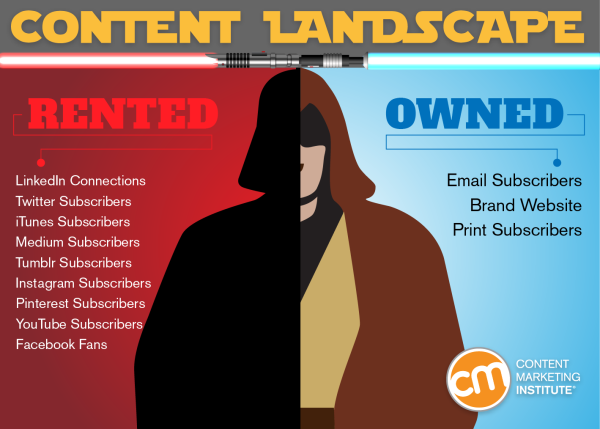 Want to see and learn about all sides of content marketing? 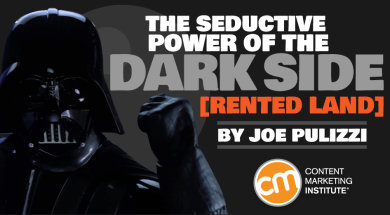 Make plans today to attend Content Marketing World 2016 – Content Strikes Back – Sept. 6-9 in Cleveland. Use code BLOG100 to save $100.